I made a planet addon just for TRAPPIST-1 e - It adds onto the TRAPPIST-1 plugin made by SpaceEngineer, and will add on to the TRAPPIST-1 system that will be released in a future update. Thanks! Would this go in the addons folder right along with the .pak file? Last edited by A-L-E-X on 09 Apr 2017 19:24, edited 1 time in total. 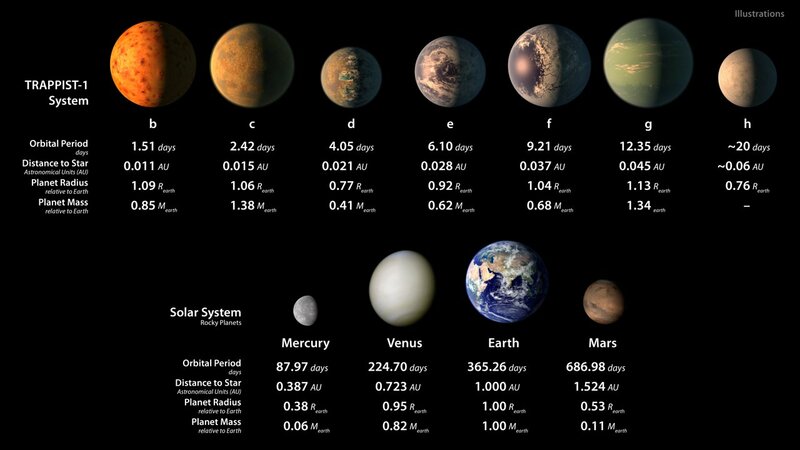 Based on that paper, Trappist-1 is a flare star (much like Proxima Centauri) so the chances of any kind of advanced life on its planets is unlikely, though simple unicellular life might still exist. I've been reading up on this some more and it seems like more advanced life MIGHT be possible if the planet can retain its atmosphere. What is required is a strong magnetic field. We recently found a planet that still has its atmosphere intact in this kind of scenario (I posted the link somewhere on this site lol) so all hope is not yet lost! The universe constantly surprises us. The new article is out, with measurement of masses of all planets using combined Kepler and Spitzer data. Outer planets became much less massive then thought before. Planet h is just 7 masses of Ganymede - smaller than Mars (although error is 100%). Densities of all outer planets are less than 2, so they must be composed of water and/or ice. So updated mod have these classes for planets: b, с - desert, d - terra, e, f - oceania (partially frozen), g, h - ice world. Planet g never though to be a gas planet with a mass of ~1 Earths. I've been playing with SE quite a bit and I found this version of the pak does not allow you to land on the planets (besides c) and when you click on a planet it instead shows the stars that lie beyond it. So I went back to the March .pak and I can now land on all the planets again. thank you Vladimir, for all the help. Funny story, using spaceengine we even corrected some of NASA's early press release images, since we noticed that Orion on their images looked different to ours (ESO), from Trappist-1 point of view. I checked trappist-1 position on the catalogue files of SE and it all looked correct, so we prompted them, and upon checking they had their coordinates for Trappist-1 wrong (they were using Uniview), and then corrected it! So yes, thanks once again! Oh gosh! Are you from European South Observatory? "...perch`e i nostri discorsi hanno a essere sopra un mondo sensibile, e non sopra un mondo di carta." TRAPPIST 1 - a system of an ultra-small red dwarf (just 0.08 Solar masses) with a 7 Earth-sized exoplanets, 3 of which are in the habitable zone, has been discovered recently. (Well, first planets in this system was discovered in 2015, but today was presented 4 new planets). To add this system to SE, download this file and put it into addons/ folder. Surface classes are given to planets based on their bulk density: b, f - oceania, d, e - terra, c, g, h - desert according to the new article, masses of outer planets are much less, so they all must be composed of water and/or ice: b, с - desert, d - terra, e, f - oceania (partially frozen), g, h - ice world. Star luminosity is increased 2 times to make temperatures on planets more high (because in SE temperature calculation on planets of cool stars is somewhat inaccurate). The system map in the new planets Chart (coming in the 0.981). Maybe I should force 'correct' planet orientation in relation to the sun? Tidally locked planets looks weird without it. 4k view from the planet b on a planets c, d, h and e. Planets there does not needs moons, neighbouring planets sometimes became as large in the sky as the Moon in Earth's sky (planet с on this image is 1.2°, or 2.5 times larger than the full Moon). 4k view from the planet e on a parent star and planets b, c, d and f.
So, this is quite off-topic but I think this is the best place to put it. There is a homeless senegalese inmigrant in Spain that got quite famous some years ago because of a rap song he did where he compared himself with santa claus (refering to the situation when had to run from police with all the top-manta pirated movies in a big sack). Ok nevermind, the thing is that he has made a trap song about TRAPPIST-1 and It made me gigle quite a lot (he talks about the problems humanity faces in a sort of pale-blue-dot-ish narrative way). Have fun! (also there are SpaceEngine shots in the video). TRAPPIST-1 probably doesn't have all those Earth like planets. They are probably bairn worlds due to the stars activity. All the planets would need super powerful magnetic fields if they were to keep their atmosphere and water.. if they did have any in the first place. What a shame.